B. Thomas (Arlington, Texas, United States) on 16 May 2009 in Lifestyle & Culture. The Puszta: Also called the Great Plain. In the 19th century, this vast prairie was the Wild West of Hungary, and immense herds of livestock grazed here under the watchful eye of the cowboys. We traveled about an hour from Budapest to a traditional Hungarian horse farm. 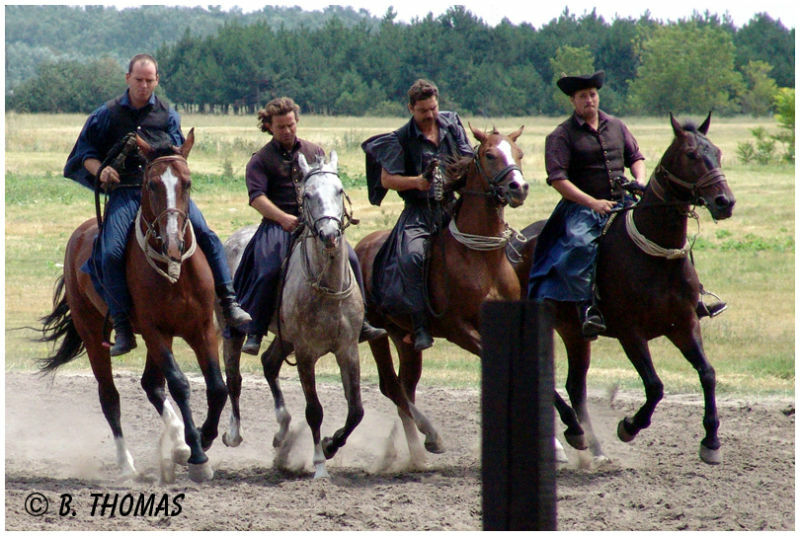 The whip carrying horsemen took us around and through the Puszta by horse-carriage. Next came a traditional horse show, which included breathtaking horseback performances and races around a series of posts. Happy riders. I like that dust which is caused by those riders. Great shot. This is a very strong shot of these charing horses! It conveys so much violent action. A great shot. @Don: They really were fast. Thanks. @Kathe: It was. They did several races and games like that. Terrific capture, Barbara. I love the flowing hair. @isidro: Thanks. I didn't like the post, but we had to stay on some seats, so there was no way to miss it. Great shot, love the action!! I LOVE this!!! How did you manage to get them all in such perfect formation? Great action shot!! @Kris: Thanks Kris. That was the way they rode, and it was beautiful to see.